The livelihoods of many medieval fen-dwellers depended on reed cutting. The rights to cut reed were carefully controlled by manorial courts. Willow and reeds were used in building and thatching houses. 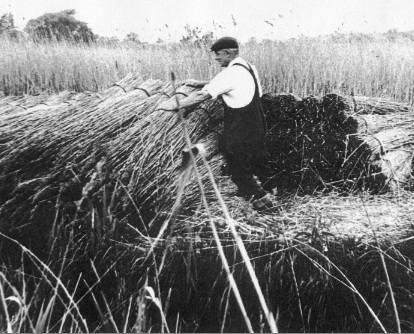 In this photo from the early 1900s, Mr Mason of Lotting Fen is still stacking cut reeds in the traditional way. Around the coast of the Wash in Eastern England lies The Fens or Fenland. Until the early 1600s, it was a vast natural area of marshes and swamps much lower that the chalk and limestone uplands that surround them. Wildlife thrived in the reed marshland and wet woodland, plants and insects flourished on the peat soils, and in the open water fish and birds were abundant. Local people relied on fishing, wildfowling, and the harvesting of reeds for their livelihoods though unpredictable flooding caused many deaths. To make the land more productive so as to feed a rapidly growing population, the Fens were drained over many centuries. This transformed Fenland from a natural wilderness into miles of intensive farmland with most of the land lying below sea level. It has been described by Ian Rotherham in his book The Lost Fens (2013), as the ‘greatest single ecological catastrophe that ever occurred in England’. Today only four pockets of the original fens survive. The final irony is that the drainage of the Fens has made the land much more susceptible to flooding as a result of the rise in sea levels caused by climate change. Fenland reaches into four historic counties: Lincolnshire, Cambridgeshire, Huntingdonshire, Norfolk, and a small part of Suffolk, an area of nearly 3,900 sq km (1,500 sq mi). The fens formed about 5,000 years ago as sea-levels rose after the last Ice Age. A fen was the local name for areas of nutrient-rich shallow fresh or salt water in which dead plants did not fully decay. Peat forms from this partially decayed vegetation, and a rich flora of plants grows in this saturated peat. Beavers, otters, water vole and other wildlife thrived in the reed marshland and wet woodland, plants and insects flourished on the peat soils, with abundant fish and birds in the open water. Nearer the sea were washes, salt marsh and tidal creeks, and in higher areas where the peat grew above the reach of land water, were moors. There were also shallow lakes or meres: Brick, Ramsey, Trundle, Ugg, and Whittlesey Mere. The largest was Whittlesey, which was in Huntingdonshire. It measured 3.5 miles by 2.5 miles, it covered 3,000 acres (1,214 ha) in winter, and it was the largest lake in southern England. There were also isolated areas of higher ground, called ‘islands’, which remained dry when the low-lying fens around them flooded. The largest of the fen-islands is the Isle of Ely, on which the cathedral city of Ely was built, which is 39m above sea level at its highest point. 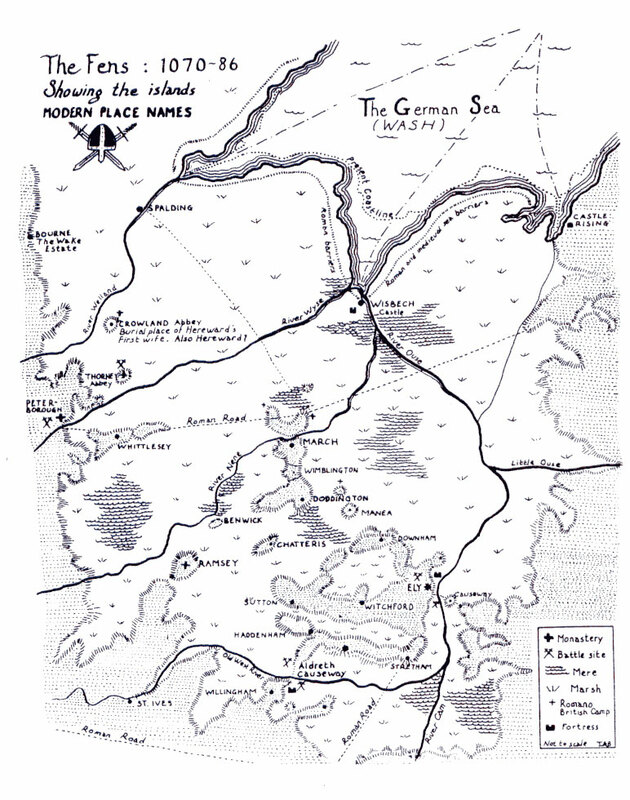 This partly imagined map of the central part of the Fens in 1070 shows vast area of marsh south of the Wash with eight or so meres, and a variety of ‘islands’. The Ouse and Nene rivers join south of Wisbech, although as can be seen from the map below, they now follow separate artificial channels to the sea. The fens were densely settled in the Neolithic and Bronze Ages. Timber trackways were used in some places to move around the flooded landscape. Helped by a fall in sea levels, the Romans built a road, the Fen Causeway, from Denver near Downham in Norfolk to Peterborough. Gravel was used to raise the road above the marshland to link what later became East Anglia and central England. The Romans also dug the Car Dyke, an 85-mile (137 km) long ditch which runs along the western edge of the Fens, which is believed to have been used as a canal. But other than this, the Fens were generally left unsettled by the Romans. After the end of Roman Britain, it is thought that peoples from the Iceni tribe of British Celts may have moved west into the easily defended Fens to avoid the invading Anglo-Saxons who were settling in what would become East Anglia. In Christian Anglo-Saxon England, hermitages on the islands in the Fens became centres of communities, and in the 10th century monastic revival under the Saxon king Edgar, these became monasteries and abbeys such as at Chatteris, Crowland, Ely, Peterborough, Ramsey, and Thorney. Ramsey Abbey, which was founded in 969, became a major centre of religious learning. The abbey’s illuminated manuscript Book of Benefactors, described the island of Ramsey. The island stretches for some two miles in length … and is garlanded roundabout with alder thickets and reed beds, [and there was] flowering ash for building the church. [The island was] encircled by eel filled marshes … fish and swimming birds. By the time of the Norman invasion, Ramsey was the fourth richest monastery in the country. Of interest, some of the family and servants of the Danish King Canute (or Cnut) were caught in a storm on Whittlesey Mere in 1020 and nearly drowned. And it is believed that Hereward the Wake, the 11th-century leader of local resistance to the Norman Conquest, sought refuge in the Fens after his escape from the seige by the Normans of the Isle of Ely in 1071.